All forms of energy are expensive, but as time progresses, renewable energy generally gets cheaper, while fossil fuels generally get more expensive. 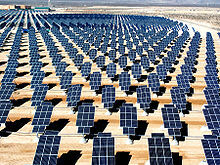 A 2011 IEA report said: "A portfolio of renewable energy technologies is becoming cost-competitive in an increasingly broad range of circumstances, in some cases providing investment opportunities without the need for specific economic support," and added that "cost reductions in critical technologies, such as wind and solar, are set to continue." The International Solar Energy Society argues that renewable energy technologies and economics will continue to improve with time, and that they are "sufficiently advanced at present to allow for major penetrations of renewable energy into the mainstream energy and societal infrastructures".